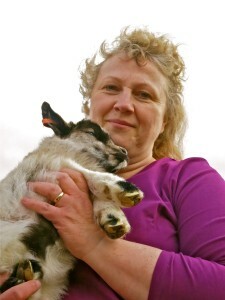 Jóhanna B.Þ., a trained nurse, and her husband Þorbjörn Oddsson, have lived on the farm Háafell in western Iceland since 1989. She is known throughout Iceland as the heroine of the Icelandic Goat. Jóhanna was born and raised on this farm and has had a deep passion for goats for as long as she can remember. Up until the year 2000 Johanna and Þorbjörn farmed like any traditional Icelandic farmers, raising milk cows and sheep before turning altogether to goat farming. They acquired their first goats in 1989 which were kept as pets but after 1999 Johanna focused on breeding the old settlement stock of goats. She received the remaining 4 hornless goats still existing in Iceland. It was neccessary to interbreed these with the more common horned variety to get a healthy fertile stock with the color varieties. She remains dedicated to reducing inbreeding by working with veterinarians and geneticists. In addition to goat farming, Jóhanna maintains a large garden where one can find more than a 180 varieties of heirloom roses and other plants. She is also experimenting with fruit trees. At Háafell she produces numerous products from her goats including scrumptious cheese and sausages and silky soft mittens, hats, and foot warmers from their fur and pelts. Jóhanna also produces a range of cosmetics from her rose garden, as well as soaps and lotions from the goats and the herb-garden.